Can Shower or Bath Water Cause Rashes? Why is Water Important to Life? Bottled water industry in America is growing at an impressive speed. There are numerous research papers that will tell you that Americans drink much less water than they should. There is research that "people who drink eight or more servings per day are less likely to report experiencing the symptoms of dehydration than those who drink three or fewer glasses of water daily". This last statement sounds a little stretched. All this research is out there to support bottled water industry. But what scientists and businessmen will not tell you is that quality of bottled water is not better than tap water. In fact over 50% of all bottled water comes from the public water supplies, or from the same tap! Fact: Bottled water is as expensive as Gasoline. A typical water bottle costs $1 - $1.50, that's $3-$5 per gallon. Tap Water is tested rigorously, and Filtered Water costs 1 - 10 cents a 1/30 to 1/100 of the price of bottled water. The research conducted by the Natural Resources Defense Council, says that out of 103 brands of bottled water about 1/3 was contaminated -- including synthetic organic chemicals, bacteria, and arsenic -- and in at least one sample exceeded allowable limits under either state or bottled water industry standards or guidelines! 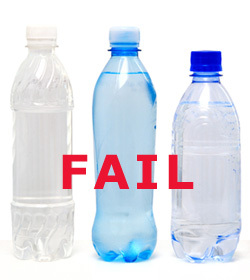 We've asked an expert chemist to conduct a study on a number of bottled water brands. Our research turned out astounding result - we found only 2 water brands that had water of better quality than local tap water - Fiji Water and Evian.The study was so alarming that we decided it was time to get ourselves and our family members a good water filter. From that point we drink only water filtered by filtration systems we know and trust. If regular bottled water is the same as tap water, what is your best approach to a clean water supply? The easiest answer is: Your Own Home Water Filtration System. We've created an Infographics to outline Filtered vs. Bottled Water issue. If you are , like many of us, stuck in office 8 hours per day, you are probably familiar with giant 5 gallon bottles of water that are preiodically being delivered to your office. This is so last century. At present , you can get a slick, modern looking, hot and cold bottle-less water cooler with a built-in filtration system that will save money and space. Look here for more information.